Storm continues to churn through the South, and many communities are still reeling. 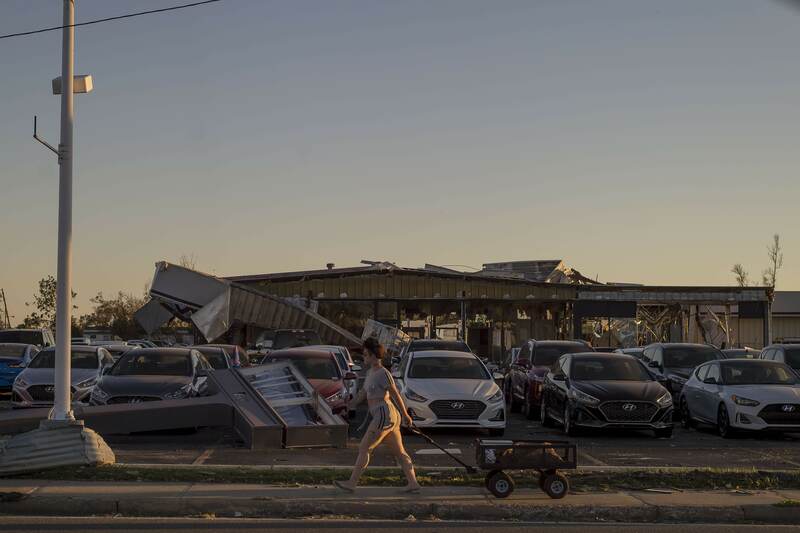 Panama City locals walk past destroyed buildings as Direct Relief brings medical supplies and funding to the aftermath of Hurricane Michael in the Florida panhandle on Saturday, October 13, 2018. Communities throughout the Florida Panhandle and beyond are beginning to grapple with the devastation left in Hurricane Michael’s wake. The storm made landfall Wednesday near Mexico Beach, Florida, as a catastrophic Category 4 hurricane with sustained winds of 145 miles per hour. At least six people were reported dead with hundreds of thousands displaced as search and rescue efforts begin in areas with extensive damage. More than 350,000 people are without power. Communities in Florida are just starting to assess the damage, while the rest of the storm sweeps through the South and into the Carolinas, just weeks after Hurricane Florence devastated the region and health facilities there were just beginning to recover. A number of health centers and clinics in storm-affected areas have turned to social media to share status reports and operational updates. Staff at the Medical Center, Navicent Health, located in Macon, Georgia, posted that the center was open to receive patients, and even had a fleet of emergency medical vehicles ready to respond. Staff at CommWell Health, located in Dunn, North Carolina with sites throughout southeastern North Carolina, posted that all locations were open to receive patients, but some were scheduled to close earlier than normal due to inclement weather. Tallahassee Memorial Healthcare, which serves a 17-county region in North Florida and South Georgia, reported that the Urgent Care Center returned to normal operating hours on Thursday, October 11. Several health centers and free clinics were still closed as of Thursday afternoon, as staff evacuated for their own safety. Direct Relief partner PanCare Health operates 13 clinics in Northwest Florida, four of which are near the water. Two are in Panama City and one in Port Saint Joe and one in Carrabelle, said PanCare’s Ashley Kelley. Kelley said Wednesday that she and most of PanCare’s staff have evacuated the area and that the system would be closed until at least Monday. “We are going to continue to remain closed until we can get to the clinics and assess the damage, then we’ll plan openings and closures from there,” she said. The situation is changing hourly for many communities, and health needs are only beginning to come into focus. Direct Relief stands ready to support impacted health centers and clinics with the medical aid needed to serve displaced and impacted patients. Editor’s note: This story was updated on Monday, October 15.